If you’ve moved into one of the Lakeville MN homes built by Key Land Homes, you have the benefit of a spacious, beautiful home with plenty of storage. 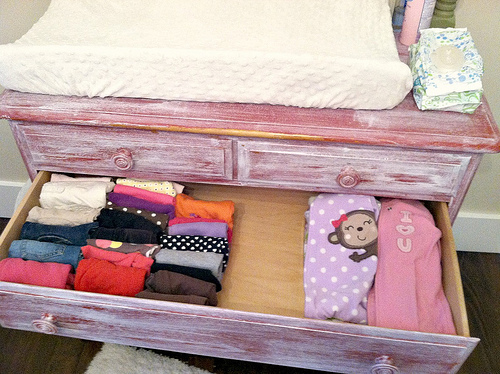 Yet when you’ve got little ones, keeping all of their clothes organized and easy to reach can still be a challenge. Those tiny clothes seem to multiply, despite the ease with which socks and other items disappear. That’s even before your baby seems to outgrow whole sections of the wardrobe in between loads of laundry. To keep clothing organized without adding to your workload, here are some simple and stylish tips. First and foremost, if you haven’t already, add a second closet rail. After all, baby clothes are tiny and you could easily add another rail — or two — below the existing one. This will double the space you have to hang clothing. You may also want to consider adding in some vertical shelving. A trip to IKEA (or an online order during a late-night feeding) gives you a variety of shelving options, including bookcases that can be added in to the closet. You can even attach the second closet rail to the bookcase for a custom arrangement. Most likely, you’ve received a mountain of clothing gifts for a variety of ages/sizes, since babies often seem to grow like weeds. If you find yourself with a large selection and don’t want to miss any handy sizes, consider making closet dividers that clearly mark the age range or size. You could decorate them if you want, or simply take some cardboard and a marker and write newborn, 3-6 month, etc. If you have a lot of two-piece outfits or just favorite pairings, simply pick up some clothes pins if you don’t already have any and easily turn a hanger into an inexpensive clip hanger. Plus, in time, those clothes pins can be used for craft projects when the little ones get older. Don’t forget door storage. The backs of closet doors can be fitted out with a variety of storage options, from the simple shoe bags that can be used to hold socks, onesies, and more, to more detailed track-based storage systems. A multi-basket trolley on wheels — another easy find at IKEA — is great for keeping shoes, onesies, socks and other clothing items together. Put it next to the changing table so you have everything you need at your fingertips. Above the changing table, consider installing hooks for lightweight baskets that can also be used for diapers and accessories. Finally, keep a couple of baskets available: one for dirty laundry, and one for clothing that your little one has outgrown. Having a basket for outgrown clothing makes it easier to separate so it doesn’t get worked back in to the regular clothing. For your dirty laundry basket, clip on a laundry bag just for small items like socks so they’re less likely to get lost in the wash.
With a little one seemingly always in your arms or on your hip, you often only have one hand free, so try to organize clothing so that it requires little digging and is always easy to reach. With the spacious closets in the Lakeville MN homes that Key Land Homes builds, you have plenty of space to add a few extra storage options. This should make dressing your little one up in favorite outfits a little easier.